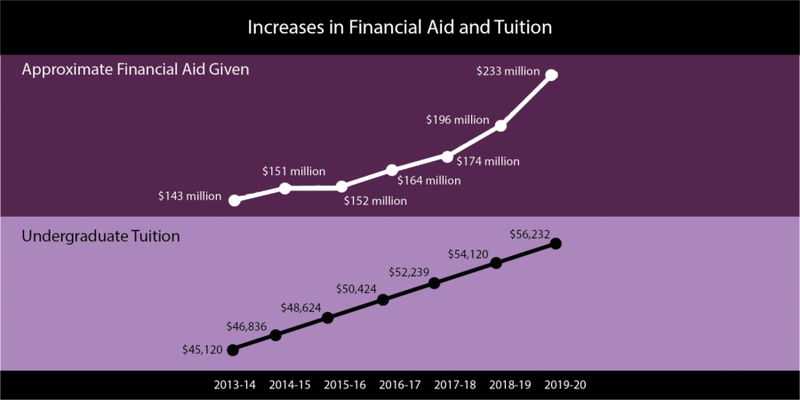 Northwestern’s tuition has steadily increased over the last seven years. Financial aid increased more than ever before for the upcoming school year. Tuition for undergraduates will increase 3.9 percent for the 2019-2020 academic school year, rising to a record high of $56,232, the University announced Friday. The 2018-2019 cost was $54,120. Overall undergraduate costs — including tuition, fees and room and board — will rise 3.5 percent. Student activity and athletic fees will increase 4.5 percent to cost $258, and room and board will increase 2.4 to become $17,019 for a double room with a full meal plan. The student health fee will remain at $201. This is the ninth consecutive year of tuition hikes — and the largest of the past seven years. At the same time, the University will allocate more than $233 million to financial aid, a 10.8 percent rise from the $210 million that was provided this year. Approximately half of undergraduates receive financial aid, according to the release. The increase in financial aid will benefit both low-income and middle-income families, the University said in the release. NU also said in the release that it will continue its 2016 policy of excluding loans from financial aid packages for first-year students. Northwestern is the most expensive school in the Big Ten for undergraduates. The only school that comes within $15,000 of NU’s tuition costs is the University of Michigan, whose out-of-state undergraduate tuition was $49,350 in 2018-2019. NU also has the priciest non-tuition undergraduate costs in the Big Ten. Schools in similar price ranges announced tuition increases around Northwestern’s rate too. The University of Southern California and Cornell University both remain slightly more expensive after a 3.5 percent increase and 3.6 percent increase, respectively. Vanderbilt University and the University of Pennsylvania came in slightly under Northwestern’s price tag after announcing 4.5 and 3.9 percent increases, respectively. At a community dialogue last year, Provost Jonathan Holloway said yearly tuition hikes are common among Northwestern’s peer institutions. The rise in costs is necessitated by NU’s increasing commitment to providing financial aid and grants, he said.